Sign up for Broadjam today to follow Cypher, and be notified when they upload new stuff or update their news! CYPHER is an intensely explosive alternative metal/rock band based in Baltimore, Maryland. 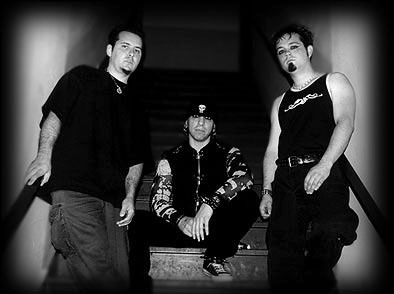 Having joined forces in 1999, the trio brings together an addictive mix of viciously raw guitar riffs, seamlessly melodic bass lines, and fist-pumping drum beats that compare to no other. After the release of Sunshine Blind their first CD, CYPHER began supporting in all area venues to a diverse and highly enthusiastic crowd. But, they needed to create the ultimate CD that culminated all of their live energy into a product the listener could take home to satisfy the craving that happens after the show. That time is now. CYPHER has just finished recording an 11 song CD titled Acid Kiss to set the world afire.